"Steadman's place is very green." "Same color as his money." SO SAY WE ALL: Reacting to the destruction of their agroships by Cylon hands, the Galacticans forge their first colony on a farm under constant threat from a land baron. REVIEW: In some ways, this the Galactica 1980's series finale. It's the last time we'll see Troy, Dillon and Jamie, and the episode shows them establishing a farming colony on Earth, finally giving the Super Scouts a place to stay, and the fleet a pied-à-terre. We're left to imagine what happens after that, but are allowed to see it as a happy ending, give or take the Cylon threat looming. 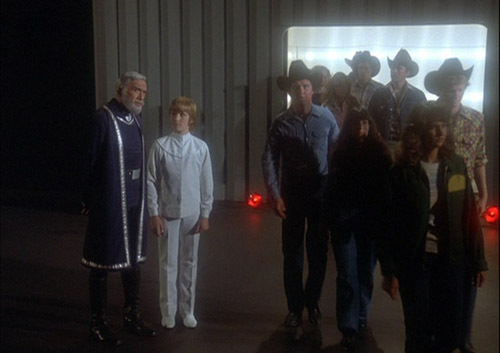 Galactica 1981 might have been all about how we finally defeat the Cylons. Who knows. Some might say, who cares. While the G1980 story arc does have value - I'm especially impressed with how serialized it can be - the actual production is plagued with problems. So while the establishment of a colony is a big step in the bigger story, the episode itself comes off as an after-school special about racism, with thoroughly dumb villains requiring Hispanic actors to explain what racism is to the audience. Veritable idiots gloating about their boss' plans to ruin small farms so he can buy up their land, that boss easily goaded into admitting he saw flying saucers thereby discrediting him, and a farming association getting no credit from me for finally doing the right thing once the "dangerous businessman" exposes himself as a lunatic. After all the tricks to destroy the Alonzo's farm (with which Galactica partners - I'm not sure what the deal is or if the Alonzos ever realize their partners are from outer space), it seems to end abruptly, with an easy change of heart. In spite of all the obstacles, the Galacticans cheat to get a good crop. They have to, because the Cylons destroy their agroships (LOTS of reused footage in this one). I guess Dr. Zee's flying saucer will carry the food back and distribute it under the Cylons' noses while the Dagget Squadron continues to make dangerous decoy runs. (Cue useless scene with an engineer complaining to Adama and Boomer that the pilots have been modifying their Vipers to make these runs possible.) But it's nonsense that the Cylons are THIS close - the dialog keeps saying the fleet is "in orbit" and certainly in Viper range, so it's probably in the Solar System - and can't locate Earth. Here's a clue: IT'S THE ONLY PLANET ABLE TO SUPPORT LIFE IN THE WHOLE AREA! Anyway, Troy, Dillon and the kids spend a night making furrows (with Cylon guns, fire the prop master! ), planting seeds by jumping over the field (thoroughly silly), and then Dr. Zee seeding the clouds with chemicals that make the crops grow overnight. Nobody questions it. It doesn't seem to affect anyone else's crops. It's just glossed over. Just another magic power the Galacticans have. Speaking of which, they can also use their bracelets to throw up alpha waves that permanently cure a horse of its wildness, and so Satan is theirs for life. What would that thing do to a human being? Or is it the same tech that can freeze guards and cops where they stand? While you're wondering about that, also ask a question about how much Troy and Dillon remember about Caprican horses given they left the planet when they were small children. The question of what the heroes know and understand is basically a script problem that is never fixed. The younger men remember horses, but Adama talks about "clouds" as something Earth has but no one else. WHAT?! The boys also can't come up with the word "farm" and need to look up "girlfriend" (a role teased for Ana Alicia's character - she was aslo Aurora on the previous series - but it's a pretty slim subplot). Does anyone at G1980 know we have that whole first series as proof Galacticans speak like normal people and have all these concepts in their heads? The whole point of BSG is that we're related to the 12 Tribes of Kobol. Playing them off as aliens who have superpowers and talk like Data is as wrong-headed as never showing Adama on the bridge, letting a boy call all the shots. The show never got out from its misunderstood premise. ALL THIS HAS HAPPENED BEFORE AND IT WILL HAPPEN AGAIN: The Cylons made targeted runs against the fleet's agroships in The Magnificent Warriors, where this footage is repeated from. HUMAN DEATH TOLL: Two agroships are destroyed (out of the one left, I guess they found/built another in their long travels), presumably with all hands lost. We further learn that all Earth missions have necessitated Viper decoys; I can't believe none of those pilots were ever killed in one of those missions or in the raid seen here. VERSIONS: The original script called this episode Harvest Home. REWATCHABILITY: Medium-Low - I'm so starved for a good episode that I almost considered giving this a higher score. It's almost... quaint. And hey, some Cylon action, with Dennis Haysbert voicing the Imperious Leader.